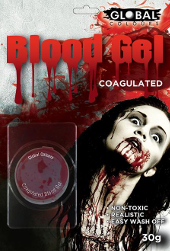 *30g pot of non toxic, coagulated blood FX gel, perfect for use on cuts and wound effects because it has a thick consistency and will not run. Applicator sponges sold separately. See also squirt blood and stage blood products to suit all effect applications. Global Colours blood gel has a very thick consistency to emulate coagulating blood, so you can create oozing and wound effects very easily. Blood Gel is a theatrical blood prop used for stage, screen, video, tv and halloween effects.